The City of Houston Solid Waste Management Department in collaboration with Houston First and Discovery Green is hosting the seventh annual Cart Art Decorating Contest on Sunday, April 14. The Solid Waste Management department is challenging local Houston area schools to decorate a green, 96-gallon recycling cart with recycled materials and art supplies in the “Protect the Species” cart art decorating contest. The contest is open to local area elementary, middle and high schools. This entry was posted in Fine arts, News on April 4, 2019 by HISD Communications. Throughout the month of March, Houston Independent School District Visual Art teachers will showcase their artistic talents in the inaugural HISD Visual Art Teachers’ Exhibition. Visual art teachers from all over the district applied to participate in the exhibition. Twenty-two artists were selected to exhibit new works for the show. They were selected by a jury of peers based upon artistic quality and instructional testimonial submissions. HISD artists will be exhibiting new, never-seen-before works for this art show. The faculty showcase is an opportunity for people to view new directions in work by some of the district’s most talented artists and educators. This entry was posted in Fine arts, News, Teachers on March 5, 2019 by HISD Communications. Theater programs at three Houston Independent School District campuses have received grants from the Andrew Lloyd Webber Initiative totaling nearly $50,000. HISD’s Chavez High School received $30,000 from the group to refurbish its set design workshop. The Chavez Lobo Theatre not only builds its own sets but also provides items for productions, classrooms and clubs for other campuses in the district. HISD’s Northside High School received $12,500 from the Andrew Lloyd Webber Initiative to improve its theatrical library, playwriting curriculum and obtain high quality costumes. The district’s Gregory-Lincoln Education Center for the Performing and Visuals Arts received $7,107 for the purchase of a spotlight, sewing machine, costumes, stage props, a projector, and to establish a Theatre Arts reading/writing program. This entry was posted in Achievement/Recognition, Fine arts, News on February 21, 2019 by HISD Communications. The lobby of HISD’s Hattie Mae White Educational Support Center was transformed into a beautiful art gallery for the district’s first-ever Houston Livestock Show and Rodeo (HLSR) Art Reception on Thursday night, showcasing over 200 student works of art. During the evening, seven student artists were honored as 2019 district winners for the HLSR School Art Competition. The winners, who range from pre-kindergarten to 12th grade, were awarded in the categories of Best of Show and Gold Medal. This entry was posted in Achievement/Recognition, Fine arts, News on January 25, 2019 by HISD Communications. Students, staff, and community members were on hand recently to celebrate the unveiling of mural paintings on three HISD campuses – Jane Long Academy, Sutton Elementary School, and Las Americas Newcomer School. The three schools are part of the Gulfton Story Trail Mural Project, which features 12 artistic murals inspired by poems written by local students. The project showcases the area’s culture while attracting visitors to the southwest Houston neighborhood — one of the most immigrant-rich areas of the city. HISD Interim Superintendent Grenita Lathan lauded the murals as a point of pride for the district’s students and families. This entry was posted in Business Operations, Fine arts, Governmental Relations, News and tagged Gulfton Story Trail Mural Project, Jane Long Academy, Keri Wittpenn, school murals on January 24, 2019 by HISD Communications. Sterling Aviation Early College High School senior Icetria Green is one of seven students selected nationwide as the inspiration for a series of mosaic portraits, which were unveiled this week in Washington, D.C. The oldest of four children raised by a single mother, Green was forced to live apart from her family for months after Hurricane Harvey. However, she has overcome those obstacles to maintain high academic standing, become senior class president and to enroll in Texas Southern University’s Trio Upward Bound program. This entry was posted in Achievement/Recognition, Fine arts, News and tagged Sterling Aviation Early College High School on January 23, 2019 by HISD Communications. Kinder High School for the Performing and Visual Arts opened in downtown Houston on Monday, welcoming students for the first day of classes in the school’s new $88 million facility. Part of HISD’s 2012 Bond Program, the school relocated over winter break from Montrose to the new five-story building constructed near the city’s renowned arts and theater district. This entry was posted in 2012 bond, 21st century schools, Building Updates, Business Operations, Campus Openings, District VIII - Diana Dávila, Fine arts, HSPVA and tagged 2012 bond, HSPVA, Kinder HSPVA on January 8, 2019 by HISD Communications. Excitement filled the air Wednesday at the new Kinder HSPVA as students toured the facility for the first time in advance of the school’s official opening day on Jan. 7. Over winter break, the school will move out of its current campus in Montrose and into a new five-story building located at 790 Austin St. in downtown Houston near the city’s renowned arts and theater district. This entry was posted in 2012 bond, 21st century schools, Building Updates, Business Operations, District VIII - Diana Dávila, Fine arts, High Schools, HSPVA, New schools and tagged 2012 bond, HSPVA, Kinder HSPVA on December 6, 2018 by HISD Communications. 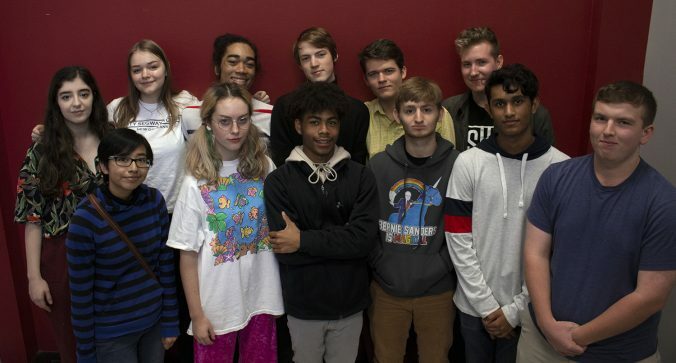 Sixteen students from Kinder High School for Performing and Visual Arts were named 2019 YoungArts winners by the National YoungArts Foundation, which identified them as some of the nation’s most promising young artists in visual, literary, design and performing arts. This entry was posted in Achievement/Recognition, Fine arts, News and tagged Kinder HSPVA on November 29, 2018 by HISD Communications. Are holiday greeting cards still on your to-do list this season? The Houston Independent School District is offering greeting card packages featuring the finalists and winners of this year’s student holiday greeting card competition, which feature creative artwork interpretations of winter landscapes, holiday traditions, and seasonal decorations. This entry was posted in Fine arts, Holidays, News and tagged Crespo Elementary, Meyerland PVA MS, Westbury High School on November 29, 2018 by HISD Communications.